About 40–50 % of cancer patients use complementary and alternative medicine (CAM). Women, and especially those with gynecological cancers, are more active in this field than men. 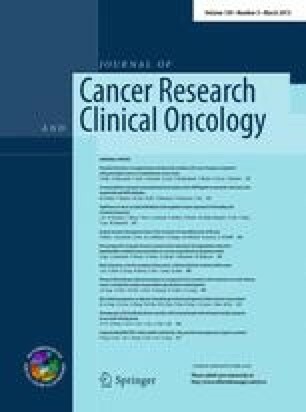 The goal of our study was to estimate the likelihood of CAM use and the likelihood of interactions of CAM with cancer therapy in the setting of a gynecological outpatient clinic at a German Comprehensive Cancer Center (CCC). One hundred consecutive gynecological outdoor patients of the CCC in Frankfurt am Main in Germany were interviewed with a standardized questionnaire on CAM use. An investigation on potential interactions was done by matching a scientific database systematically. Sixty-nine of the interviewed 100 women received chemotherapy, 23 endocrine therapy and 41 monoclonal antibodies. In total, 64 % used CAM, 48 % used at least one substance-bound CAM. In 17 out of those 48 cases (35 %), interactions were unlikely, whereas they were probable in 14 patients (29 %). Thus, a third of all patients in this study were in danger of interactions. More than half of all CAM users and three quarters of users of substance-bound CAM are at risk of interactions. This number is independent of whether the patient is taking chemotherapy, endocrine therapy or antibodies. The frequency of CAM use we found is in line with international data from CCCs in the USA. To our knowledge, this is the first study publishing data on the frequency of potential interactions. Thus, an initiative to protect women from the dangers of uncontrolled CAM use is urgently needed. In the discussion, we propose a concept of how to achieve this aim. This study was conducted on behalf of PRIO—working group Prevention and Integrative Oncology of the German Cancer Society. The online version of this article (doi: 10.1007/s00432-012-1336-6) contains supplementary material, which is available to authorized users.